Our company specializes in the manufacturing, supplying and exporting of Manual Coding Machines such as Universal Hand Stamping System and Hand Held Coder. 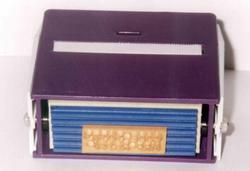 These manual coding machines are extensively used in the industries and give high quality print. In addition to this, these are available in plethora of specifications and ranges. Our Hand Stamping System for Pouches are Manual Coding kits are like mini printing shop in your office or factory. 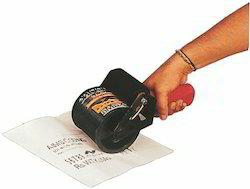 Make your own instant rubber stamps whenever you need it. The message to be printed is very easily composed by just push fitting the grooved stereos (easily changeable) on to the groove base mat. The Inking system consists of a rechargeable felt pad, which is fully enclosed allowing the use of fast-drying & indelible solvent-based inks for porous and non-porous surfaces. When you press on the handle, the print head slides outside for coding / printing onto the product & on release, rotates & slides back into the housing for inking. Non Porous Hand Held Coder Model HHC – 95 – SN is an easy to use large character manual printer for in-house printing of Batch No., Product Name, Handling Instructions, LOGOs, etc. on plastic bags, barrels, etc. in place of Stencils or Screen Printing. The message to be printed is composed by push fitting the easily changeable grooved stereos on to the grooved ring drum. The inking system consists of a rechargeable ink cartridge & the stereos re-ink automatically as they pass below the cartridge. Maximum printing area is 95 mm X 300 mm. (Set inclusive of 1 Ink Cartridge, 1 Lit. Non-Porous Ink & 14 mm. Alphanumeric Character Set.) This coder is suitable for printing LOGOs & fixed information on plastic bags, barrels, etc. Printing Area: 95 X 300 mm. Impressions: 1,000 per charge of 40 ml. 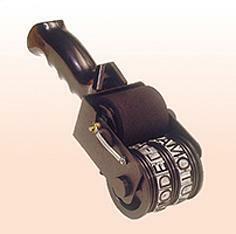 Hand Stamping System for Pouches are like mini printing shop in your office or factory. Make your own instant rubber stamps whenever you need it. The message to be printed is very easily composed by just push fitting the grooved stereos (easily changeable) on to the groove base mat. The Inking system consists of a rechargeable felt pad, which is fully enclosed allowing the use of fast-drying & indelible solvent-based inks for porous and non-porous surfaces. We provide Hand Stamping System for Pouches that are Manual Coding kits are like mini printing shop in your office or factory. 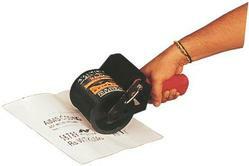 Make your own instant rubber stamps whenever you need it. Very low cost system for small quantity printing or as standby for semi-automatic and automatic machines. We provide Hand Held Coder for Cartons to our clients that are easy to use large character printers for in-house printing on corrugated master cartons & barrels. The message to be printed is very easily composed by just push fitting the grooved stereos (easily changeable) on to the groove ring drum. 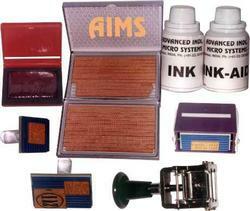 The inking system consists of a rechargeable ink cartridge, which can be used for porous and non-porous surfaces. When you place the coder on the carton & roll it, the stereos automatically get inked & print very clearly on the substrate in one action. When you pick up the marker, the print drum automatically rotates back to the zero position due to the inbuilt spring action, ready for the next printing which will be from the start of the message at the same position. Printing Area 95 X 350 mm. Impressions 1,000 per charge of 20 ml. / 40 ml. / 10 ml. Hand Held Coder for Cartons are easy to use large character printers for in-house printing on corrugated master cartons & barrels. The message to be printed is very easily composed by just push fitting the grooved stereos (easily changeable) on to the groove ring drum. The inking system consists of a rechargeable ink cartridge, which can be used for porous and non-porous surfaces. When you place the coder on the carton & roll it, the stereos automatically get inked & print very clearly on the substrate in one action. Printing Area 190 X 350 mm. Hand Held Coder for Cartons are easy to use large character printers for in-house printing on corrugated master cartons & barrels. The message to be printed is very easily composed by just push fitting the grooved stereos (easily changeable) on to the groove ring drum. 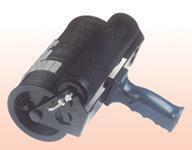 The inking system consists of a rechargeable ink cartridge, which can be used for porous and non-porous surfaces. Printing Area 50 X 195 mm. Looking for Manual Coding Machines ?